The Borobudur Temple of Indonesia was founded by a king from the Saliendra Dynasty in honor of Buddha and the true king of Bodhisattva. It is easily the greatest Buddhist monument in the World, with perhaps the Angkor Wat in Cambodia in close contention for the top spot. The name Borobudur is said to have been derived from Sanskrit words ‘vihara Buddha uhr’ which means ‘Buddhist Monastery on the Hill’. The temple is located about 42 kilometers from the city of Yogyakarta in Muntilan, Magelang. AD750 – The colloidal temple is believed to have been constructed in AD 750 to AD842. This is about 300 years before Angkor Wat was constructed and 400 years before the great cathedrals of Europe were constructed. There is very little details about the early history of the temple apart from that thousands of workers carved out the 60,000 cubic meters of stone in the tropical heat. 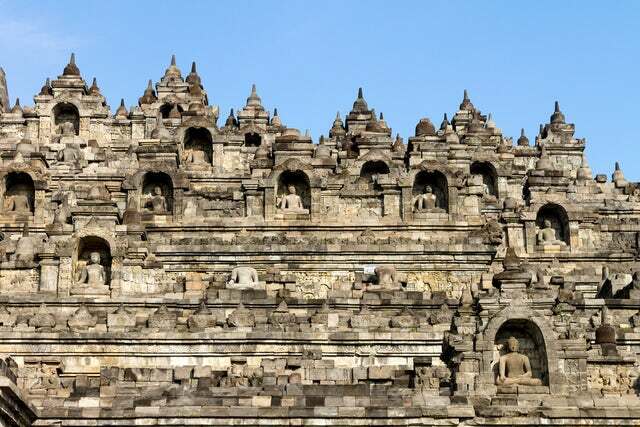 11th century AD – Due to political considerations in Central Java, divine sites, of which Borobudur was part of, were neglected. The sanctuary will be ravaged by natural events such as volcanicity. 19th century – The sanctuary remained idle until it was rediscovered in the 19th and a restoration campaign was initiated by Theodor van Erp. 1973 to 1982 – Another restoration was done in this period. The temple complex is a harmonious blend of Temple Mountain, stupas and ritual diagram. It was built on several levels around a hill with the 1st level forming the base and comprising of 5 terraces. Above this level, you will find the concentric platforms that are crowned by a stupa. Further, you will find the monumental stupa at the highest level. The upper stupa is accessed via a stairway. The five levels illustrate the different phases that a soul goes through before redemption. They also represent the episodes from Buddha’s life. The complex also features circular terraces that are decorated with a whopping 72 openwork stupas, each containing a statue of Buddha. Make a visit to this Indonesian UNESCO listed World Heritage Site and get some insightful history of the Buddhism religion.